The world of cufflinks is a place full of many types of cufflinks and as there are so many different styles we thought we would put together a little page that explains the different types of cufflinks for you. There are about eight different types of cufflinks that we can think off of the top of our heads and they all have different benefits and looks. Chain link cufflinks are top of the list as they are the most traditional and original of all the cufflinks. This type of cufflink is easy to use as you just thread the chain with the ornament through the button holes. Unlike other cufflinks there is no need to worry about which way around you should wear them as the both ends of the chain can be presented as they are both dressed with ornaments. This style of cufflink also offers the wearer a looser fitting cuff. These are a great looking cufflink but not as popular as some of the more sturdy and easilyu fitted cufflink types. This type of cufflink offers the most secure fastening as the fixed backings are made from the same material as the front, this forms a nice rigid cufflink. However due to the immovable parts this type of cufflink can be quite tricky to fasten. There are some great benefits though, this cufflink is light weight, smaller and brings the cuffs together nice and close. This type of cufflink is both stylish and elegant. When I wear cufflinks this is the type I always go for, it is the most common found cufflink and is great for most wearers. The bullet or torpedo cufflink also known as the toggle cufflink is easy to use and securely fastens offering the wearer a great cufflink with little to no hassle. You can see from the image that the bullet is pivoted between two posts, when you flip the bullet to run inline with these posts you can thread the cufflink through your cuff holes, once this is performed you can then flip the bullet back and hay presto the cufflink is secure. Whale back or whale tail cufflinks are very similar to bullet style cufflinks. They have a rigid flat ‘whale tail’ which is attached to a single straight or slightly curved post via a pivot point. This cufflink type is nice and easy to use as you flip the whale tail flat against the post, thread the post through the cuff holes and then flip the whale tail back to secure the cufflink. 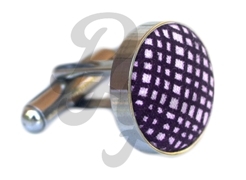 Fabric cufflinks can come in any of the different cufflink types we have mentioned but instead of a metal, enamel, jewellery, glass of other finish they are finished with a patterned fabric. This type of cufflink is often considered a good cufflink for informal occasions as the cufflink is simple and is perfect for casual occasions. Great for daily use in offices or just general wear. The ball return cufflink comes as a fixed styled cufflink, this means there are no moving parts just one end with the ornament and one end that you thread through the cuff holes. The post is usually curved and the ball opposite the ornamental head is often button shaped or slightly rounded resembling half a sphere. These cufflinks are easy to put on and provide a looser fitting than the bullet style torpedo cufflinks but not as loose as the traditional chain type cufflinks. The knot type cufflink is a simple and cost effective cufflink. Often made from synthetic or natural silk yarn these cufflinks provide a simple solution to your cufflink needs. They are often more affordable but less desirable and not nearly as durable. The heads of the cufflink are connected via a short flexiable length or cord which helps with the using of the cufflinks. 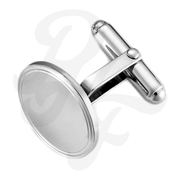 This type of cufflink is very much considered a more causal style for day to day use. Engravable cufflinks come in many different cufflink types, the most popular being the bullet pivot style. These cufflinks have the added bonus of our customers being able to personalise them by adding initials or a short message. 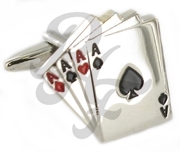 This style of cufflink is perfect for personal gifts. 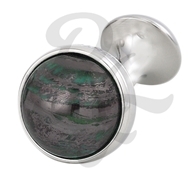 Novelty cufflinks are mainly produced in the torpedo bullet style of cufflink. These fun take on the traditional formal cufflink are popular with wedding parties and people who like a bit of fun in there life. There are such a wide range of novelty style cufflinks there is normally something that will take your fancy. See our full range of cufflinks here.